Mix together all ingredients by hand, except chocolate. Form into balls with about 1-2 tablespoons Note: if mix is too runny or soft, add more rice Krispies, if its too crumbly, add more peanut butter. Put on a cookie sheet on parchment paper, and refrigerate 1 hour or more. Melt chocolate over double boiler or in saucepan over low heat. 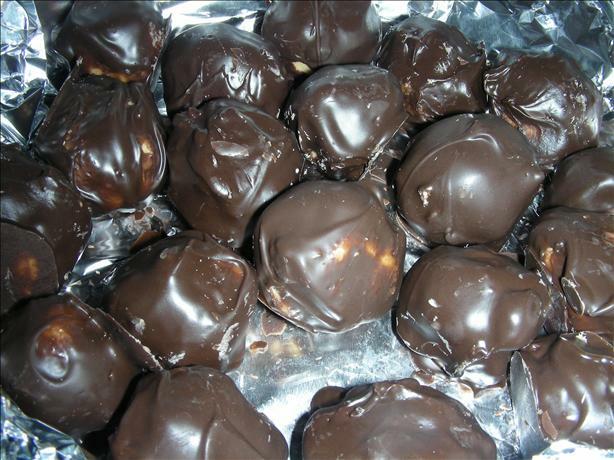 Dip balls in chocolate, and place back on parchment paper and put in the fridge until set. Store in a tight container in the fridge. Enjoy!